This recipe is easy because you can use any meat that you might have. For this recipe, we had leftover (uncooked) pork tenderloin and flatiron steak from earlier in the week. You can also use ground beef or turkey. Warm a large pot on the stovetop. When the pot has heated add olive oil. When that is warm add onions and garlic and cook until translucent. 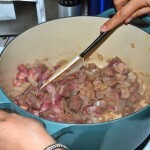 Add the pork and steak and cook on medium heat until the meat is browned and about 75% cooked. 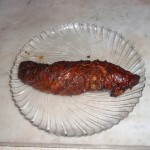 The meat will continue to cook as you make the chili, so you do not want to overcook the meat. When the meat is browned, add the flour and stir. This will add a little bit of thickness to your chili. What makes this recipe so easy is that now you just need to add the beans, corn, tomatoes and juice, and the spices and stir. 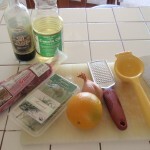 Let this mixture cook for about 40 minutes or until you get the desired flavor. A few minutes before you are ready to serve, add the lime juice. We think that this adds a little tang to the chili. Once you have put your chili in the bowl, top with shredded cheese (and sour cream if you like). One suggestion if you like sour cream and heat is to mix in a little bit of adobo sauce from a can of chipotles in adobe to the sour cream. A little adobo goes a long way, so be careful of how much you add. The flavor is incredible, spicy and smoky, and will add a great flavor to your chili. We love to serve this chili with cornbread, so please see our Skillet Cornbread recipe to serve with this dish. As with most stews and soups, this recipe will get better the next day, so make enough for leftovers! To begin making this easy and delicious soup, start by adding the beans to your slow cooker, which is set to Low. 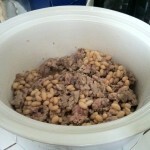 On the stove top, cook the sausage until almost cooked through and then add to crock pot with the beans. 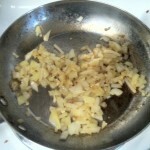 In the drippings of the sausage, cook the onions and garlic until translucent. 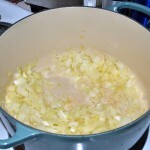 Add the onions and garlic to the crock pot. 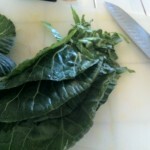 Add the chicken stock and collard greens at this time. Add the sugar, which will combat the bitterness of the greens. Cook on Low for 4-6 hours or until greens have cooked down. This soup is that easy! Feel free to serve with a sliced baguette. 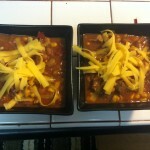 This recipe was told to us by Tom from Nashville, a wonderful winemaker at Martin Ray Winery in Sebastopol, CA. Pre-heat oven to 375. Cut tomatoes in half, toss with (olive oil - pinch of salt/pepper) and arrange on cookie sheet or roasting pan. Once the oven is ready, place the tomatoes in the over for about 10 - 15 minutes or until nicely roasted. 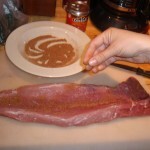 Butterfly pork tenderloin using a sharp knife. 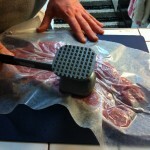 Place sheet of wax/parchment paper over the butterflied pork and use a mallet to flatten out the roast. Be sure to flatten the roast evenly so when you roll the roast together with the filling inside the meat will cook evenly. 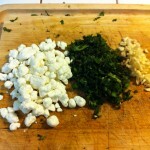 Combine the garlic, basil, goat cheese, salt and pepper in a bowl and mix well until the ingredients are evenly distributed. Spoon mixture evenly into the middle of the flattened pork roast and roll the meat until the roast is evenly closed and the mixture is sealed inside. Place the meat in a roasting pan and bake at 375 for about 25 minutes. 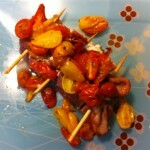 Remove from the oven and let the meat rest for a few minutes and top with roasted tomatoes. 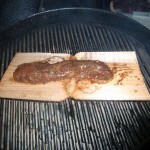 Soak cedar plank for at least an hour before grilling. Wash meat, pat dry with paper towels and set aside. For the marinade, combine the orange zest, orange juice, shallot, garlic, soy sauce, olive oil, sesame oil, brown sugar, garlic powder, rosemary and thyme in a resealable plastic bag. Mix well and then add the meat. 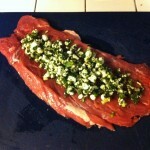 Be sure to gently move the tenderloin around so the meat is completely covered with the marinade. Marinate in the refrigerator for at least a few hours, ideally overnight. 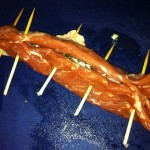 Remove the meat from the refrigerator around 30 minutes before grilling to allow the meat to come to room temp. 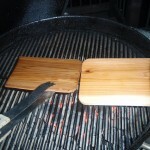 Prepare the cedar plank by placing the plank on the hot grill. After about 1-2 minutes flip the plank over and place the meat on the side that was facing down. Close lid and grill for about 20 minutes or until the meat thermometer reads between 150 and 160 degrees. Remove meat from the grill and allow the meat to rest for at least 5 minutes. Butterfly pork tenderloin and combine next 7 ingredients for dry rub. Sprinkle rub liberally all over the pork and take care to rub the seasoning into the meat well. 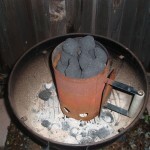 Prepare coals for BBQ or set gas grill at medium heat and grill pork for 10 - 12 min each side or until slightly pink in the center. Rub will char on the grill and add fantastic flavor to the finished product. Remove meat from the grill and set aside to rest for 5 minutes. 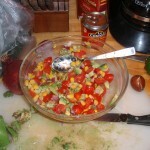 For salsa, chop tomatoes, red onion, cilantro and add to a serving bowl. 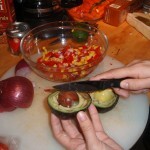 Slice avocado and add with corn to the bowl. Squeeze the juice of 1 lime over the salsa and stir; lime juice adds nice flavor and preserves wonderful colors of the ingredients. Cover and store in the refrigerator. 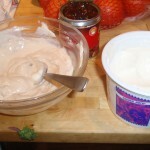 To make chipotle sour cream, add 1/2 to full pint of low fat sour cream to a bowl and add 1-2 spoonfuls of adobo sauce from the can of chiles for mild spice. You can adjust the spice higher by adding more sauce or seeding & chopping some of the chiles and stirring them in. 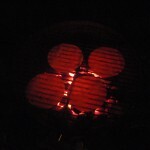 Warm tortillas over coals or over medium heat on the gas grill for about 30 seconds a side. If you prefer, you can warm the tortillas in the oven by wrapping a stack in a damp paper-towel and baking for 20 minutes at 250 degrees. If you need to micorowave the tortillas, wrap them in a damp paper-towel and microwave on high for 45 - 60 seconds. Prepare the pesto by combining all of the ingredients in a food processor and blending well. minutes. Season with salt and pepper. against grain of meat and serve. of the pesto on top of the pork. Garnish with cilantro.